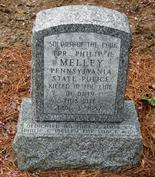 A memorial stone was dedicated on Monday June 2, 2008 at the site where Philip C. Melley was killed. TO SEE ENLARGED IMAGE OF MEMORIAL STONE, CLICK PHOTO TO LEFT. Trooper Melley was killed in the line of duty on November 3, 1957 by a 16 year old youth. The youth had an argument with his parents because they did not want him to go squirrel hunting with a 12 gauge shotgun. An argument occurred, and the youth left the home and went into the woods behind his home in Douglas Township, Berks County (near Boyertown). The local Police Chief Irvin R. DeHaven was called to the home. He entered the woods and found the boy. He tried to talk him into surrendering the gun. After an hour the Chief went back to the home and called the State Police at Reading. Two Troopers, John A. Devine and Thomas McCann were summoned to the home. Melley, a criminal investigator, was notified and on his way. The two Troopers and the Police Chief went into the woods and eventually all three were encountered by the youth with the shotgun. The boy ordered the officers to disarm and eventually handcuffed the two Troopers to a tree. Chief DeHaven was not handcuffed. At that time Trooper Melley arrived at the scene in civilian clothes with a rifle. He told the boy that he was squirrel hunting. The youth told Melley to halt or he would shoot the two Troopers. Melley tried to talk to the boy moving closer all the time. When he was only a few feet from the boy, Melley lunged at the boy who fired a point blank shotgun blast into Melley's forehead, killing him instantly. The youth then ran home and told his mother what he had done, and was eventually arrested by Troopers. Trooper Melley was raised in Summit Hill, PA. 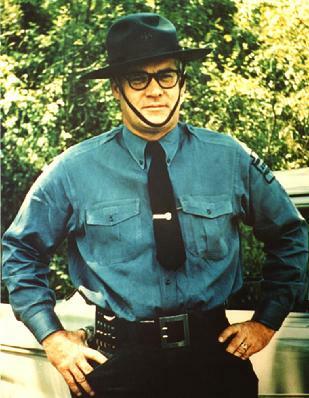 He was 43 years at the time of his murder, and had nearly 20 years of service in the State Police. He was laid to rest at St. Joseph's Catholic Cemetery at White Bear, (near Summit Hill).